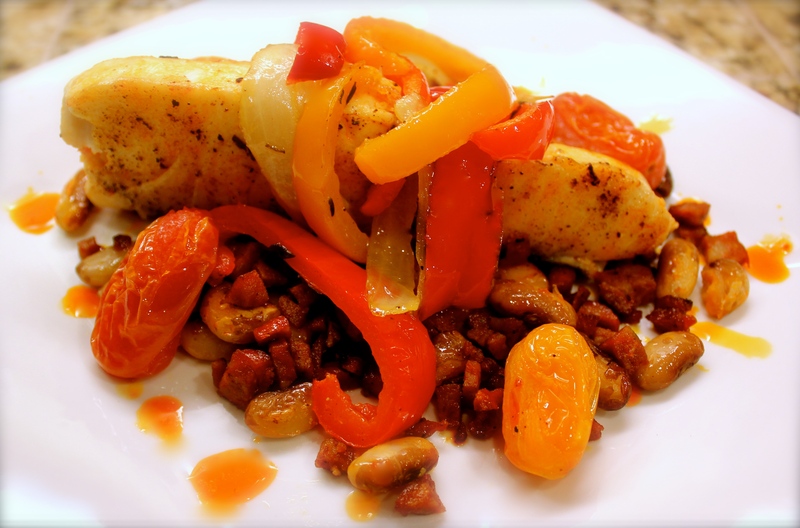 Halibut and Spanish Chorizo are a classic duo! This is an easy summer time dish that really doesn’t need a recipe, since all the ingredients are just cooked and plated together. I made a nice pot of snowcap beans I bought through https://elegantbeans.com They have a wonderful selection of dried beans and they taste amazing. I simmered them along with 2 bay leaves, thyme sprigs and a shallot pierced with about 10 whole cloves. 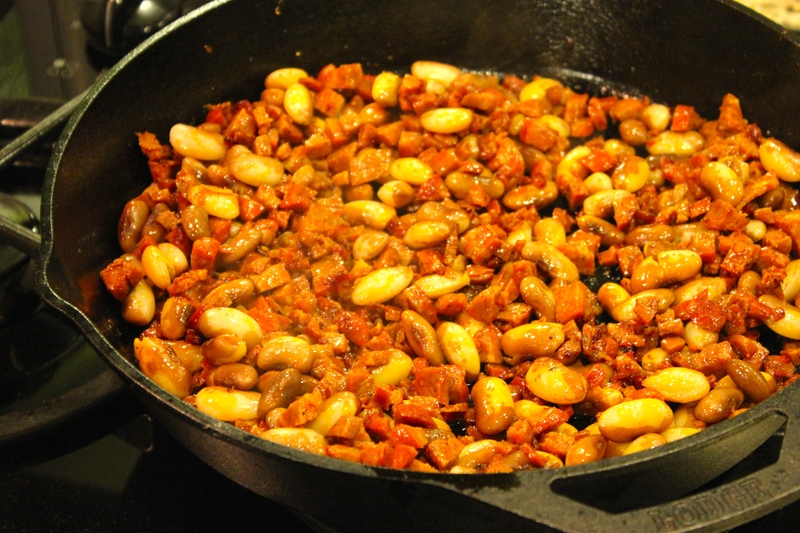 You may omit making dried beans if time is limited and used canned cannelloni beans, or boil some whole skin-on fingerling potatoes, and just slice down the middle after boiling and sauté with the chorizo if you like. The peperonata was easy too. Because the vegetables were simply sliced, tossed with a little oil, fresh thyme leaves, onion powder, salt and pepper and roasted on a cookie sheet for about 25 minutes. The halibut was seasoned with salt and pepper, sautéed in the same pan the chorizo was sautéed in. 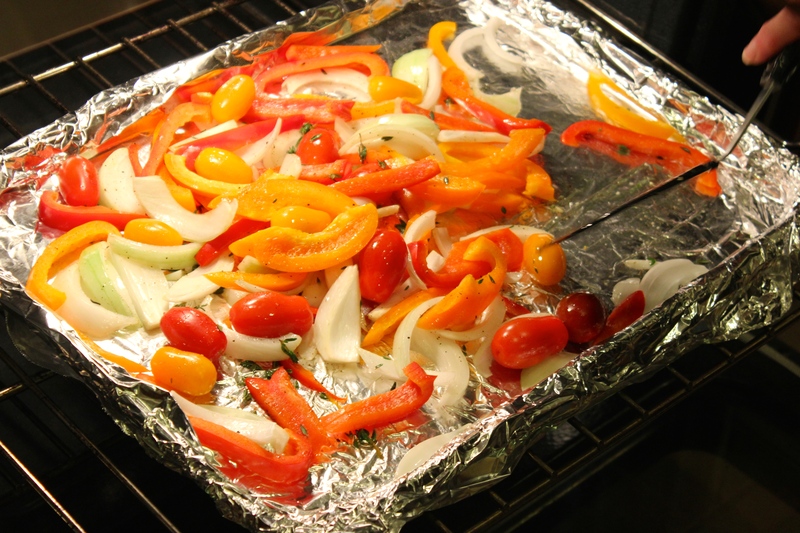 I sliced two bell peppers, one large white onion and several whole cherry tomatoes and tossed them on a foil lined baking sheet. I seasoned them with a bit of grape seed oil, kosher salt and pepper, onion powder and fresh thyme leaves. I placed them in a 450 degree oven for about 20 minutes, and turned them half way through. While the peppers and onions were roasting, I chopped some Spanish Corizo and sautéed it for about 5 minutes over medium heat. Then added the pre-cooked snowcap beans and sautéed them for about 4 more minutes (being careful not to break the skins of the beans). I removed the beans and chorizo to a bowl, and seasoned the fish with salt and pepper, and a little smoked paprika then added it to the pan, and seared it in the oil from the sautéed chorizo. Once the fish was done, I plated everything together. DONE!! Bon Apptite!! 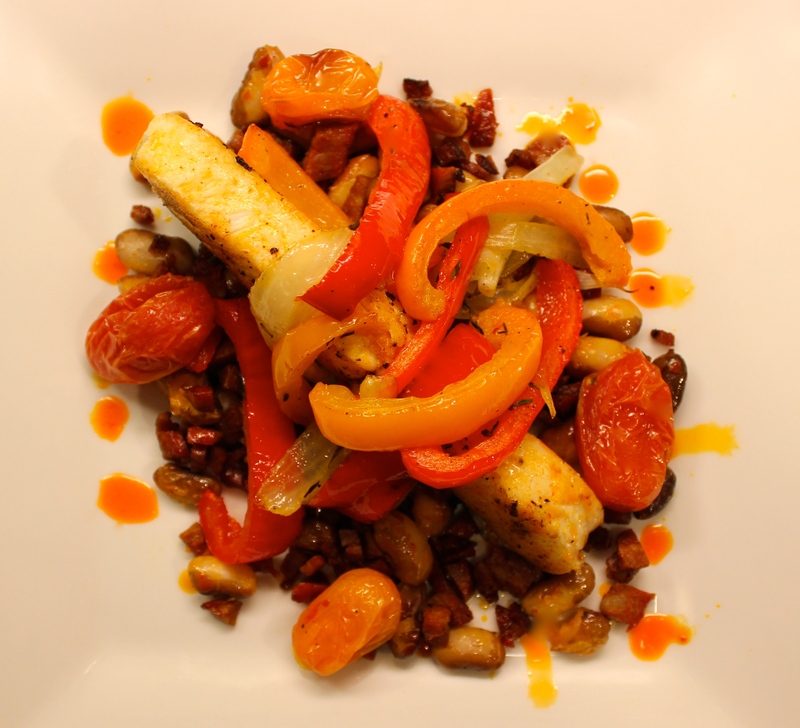 Halibut and Spanish Chorizo are a classic duo! This is an easy summer time dish that really doesn't need a recipe, since all the ingredients are just cooked and plated together. I made a nice pot of snowcap beans I bought through elegantbeans.com. They have a wonderful selection of dried beans and they taste amazing. I simmered them along with 2 bay leaves, thyme sprigs and a shallot pierced with about 10 whole cloves. You may omit making dried beans if time is limited and used canned cannelloni beans, or boil some whole skin-on fingerling potatoes, and just slice down the middle after boiling and sauté with the chorizo if you like. Slice the bell peppers, and onions into long slices. 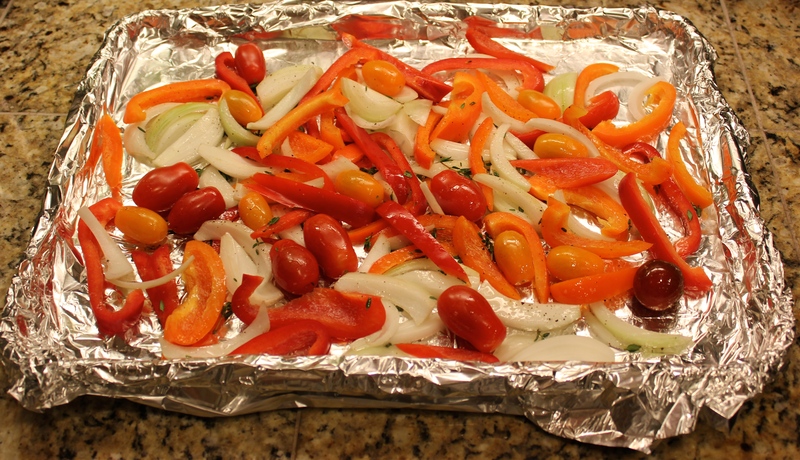 Add peppers, onion, cherry tomatoes to the sheet. Drizzle with a little grape seed oil. Add onion powder, fresh thyme leaves and salt and pepper to taste, mix lightly. Place in the oven for about 10 minutes. Turn vegetables and set the timer for 10 more minutes. 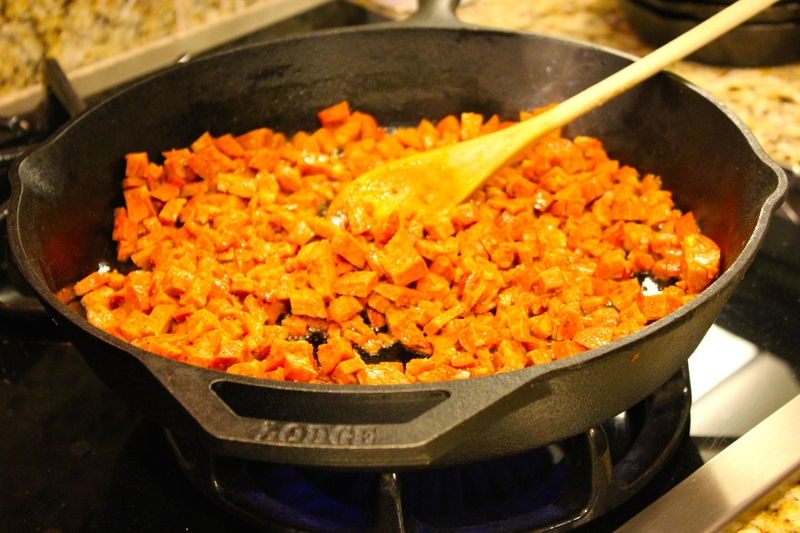 While the peperonata is baking, cut the chorizo into small pieces, and add to a large frying pan. Mince the shallot and add to the chorizo. Saute over medium heat for about 5 minutes. Add the pre-cooked snowcap beans and continue to sauté for about 3 minutes (careful not to break the bean skins. Remove all to a bowl (leave the rendered chorizo oil in the pan) and serve after halibut is seared. Season the fish with smoked paprika, salt and pepper. Heat the pan that the chorizo was sautéed in to medium-high heat. Add the halibut and fry about 2 minutes per side. * The snowcap beans (1-1/4 cups)were soaked in a pot of water overnight. Then drained and added to fresh water and set the pot to simmer over low heat. I pierced a shallot (substitute a small onion) with about 10 whole cloves. I added this to the water along with some black pepper, 2 bay leaves, a few thyme sprigs. I simmered the beans for about 90 minutes, then added a tablespoon of kosher salt. Simmered another thirty minutes, and drained well, and discard everything except the beans. Added to the chorizo and sautéed.